I'm in Buffalo, New York, for a few days, visiting family. I haven't been here since my grandmother's funeral in late 2002, which is way too long. Although I never lived here, it's a kind of second home to me. Both of my parents grew up here, and as a child, I spent lots of time here with grandparents, aunts and uncles, cousins--my whole extended family, really. I'm staying with my Aunt Toby and Uncle John in their beautiful contemporary home that my uncle--a very accomplished architect--designed, and it is a real pleasure. My aunt and I begin the morning with a short driving tour of the city. A lot has happened since I've last been here. Like many Rust Belt cities, Buffalo has been down for a long time. Even when I came as a boy, there were lots of abandoned warehouses, decaying infrastructure, dilapidated neighborhoods. The steel mills and other heavy industry left in the late '60s and early '70s and the bottom fell out of the economy. Folks moved away, largely to warmer sun belt cities. Young people departed in droves. When my grandfather, Joseph Fink, was a rabbi here, Buffalo was a major American city, in the nation's top ten most populous urban areas. Today it doesn't crack the top fifty. But the city is experiencing a renaissance. As we drive through the streets of downtown, I see some of those abandoned warehouses being transformed into urban condos, where young people want to live. There are micro-brew pubs on many corners and a renewed sense of civic pride. Our first stop is Forest Lawn Cemetery. It's a huge place, a city of the dead, including quite a few historical figures of note. I go to my paternal grandparents' gravesite and leave two stones. My grandfather, Rabbi Joseph Fink, died when I was a small boy and I have only the dimmest memories of him. Yet many folks here still remember him fondly and vividly, and I like to think that some of his spirit lives on in me. I hope that I have some of his gifts as a rabbi and a teacher. By contrast, my grandmother, my Oma, was a powerful force in my life. She was the unquestioned matriarch of our family: incredibly smart, tough, gracious, loyal. She encouraged me to be a writer, to stand tall in my beliefs, to speak my mind. It is a great honor to visit their graves. My maternal grandparents, Ray and Inez Hoffman, are also in Forest Lawn. But they are not buried. My grandfather hated the thought of being in the earth, so he bought vaults in the mausoleum or, as he called it, "The Condo." I went there, too, but did not take a picture, as it felt weird taking pictures indoors in the mausoleum. They were both enormously influential people in life. My Papa owned a prominent printing press in town. He was quite the character: strong, opinionated, sometimes prickly but a very loving grandfather, and a master story teller. We loved hearing his tall tales and I like to think that some of that wore off on me. My grandmother was the hostess par excellence, a superb cook and baker, generous and kind. A good friend, a wonderful listener. All of my grandparents gave me extraordinary gifts. After the cemetery, we go to the Albright-Knox Gallery. One wouldn't know, from the neo-classical exterior, that it is one of the finest contemporary art galleries in the country. Aunt Toby and I have lunch in their very hip cafe and then take in the collection: Jackson Pollack, Rothko, Calder, etc. I see a lot that I like but my favorite is the piece outside, made up entirely of old aluminum canoes. The first boat I ever owned as a Grumman, which I bought for $50 from a suite-mate my freshman year of college. There's nowhere I'd rather be than on a river, but this was pretty close: a kind of wild flowering of canoes! In the afternoon, I go for a walk down Elmwood Ave, which is at the heart of Buffalo's urban renewal, a strip that features old houses, new boutiques, restaurants, and parks. It feels to me like the heart of this city, the combination of old grandeur from its urban heyday at the turn of the 20th century and the grit that has sustained it through more difficult times. There's a kind of beauty in the decay, too--and I've always been drawn to that kind of beauty. I pass the house where my mother's parents lived just before she got married to my dad. It's still pretty grand. Then I walk by so many classic Buffalo vistas, houses and pubs and grungy streets and elegant avenues. Dinner is back at Toby and John's, with my cousin Lynn Hirsch and the new rabbi at Beth Zion and his wife, who is an accomplished ketubah artist. It's a great evening of conversation, laughter, shared memories, new perspectives, fabulous food and thought-provoking discussion. I arrive in the sleek Raleigh-Durham airport after a long flight from Boise and my mom picks me up outside. It's good to be here. It has been too long since I've last visited. Great to see Mom and nice to experience the lovely early spring weather here. We start the day attending a classical music class at Mom's synagogue, Judea Reform, here in Chapel Hill. The congregation's new music director teaches the class, and it's terrific. He focuses on pieces that composers have based on earlier composers' works: Brahms' variations on Paganini and Elgar's Enigma Variations. He has a great time playing clips and sharing stories, and he's superb at offering non-musicians some basic music theory that helps us appreciate the works. It's a reminder of how much I love music, of all kinds, and learning more about it. Mom and I have a lovely lunch together, I work out at the gym, and then Charlie joins us for Shabbat dinner at Mom's house. It is such a pleasure to have Shabbat dinner with my mother, and to not have to worry about running off to lead services myself! I think it's important for clergy to have opportunities to sit in the pews, to be part of the congregation. The service looks and feels so different from here than it does on the bimah. And yet it's the perspective that everyone except us shares all the time! The service itself features a guest artist, Cantor Linda Hirschhorn. So between her and the music director from the shul, there is a lot of wonderful music. I've always thought the ideal service is sung from beginning to start, without any reading (which, in my view, always diminishes the energy level). This one is pretty close. Cantor Hirschorn tells a terrific story about growing up in an Orthodox shul in New York, how hearing the cohanim (those descending from the ancient priests) offering their blessings awakened a sense of mystery and awe and musicality for her as a little girl watching from the women's section upstairs. And the rabbi, Larry Bach, offers a short, inspiring and insightful d'var Torah. I really like the physical space, which is open, light, contemporary, accessible and egalitarian, and surprisingly warm. It's a peaceful and joyful night, a Shabbat full of shalom. I drive out to Durham to attend Shabbat morning services at the Conservative Beth El congregation. More often than not, when I'm out of town, I prefer the Conservative service on Shabbat morning. The place is very different from Judea Reform. The building is kind of ramshackle, but the way everything--from the paint on the walls to the wood paneling to the old editions of the Siddur Sim Shalom--is a little worn is comforting to me. It shows the abundant use that comes of love. The service itself is much the same: long, rambling, heimish. The congregants seem like a real community, shmoozing and genuinely happy to see one another. And the rabbi is like the head of the family, sharing little bits of midrash here and there throughout the morning, imparting his wisdom without any arrogance or pretension. It's a nice place to be. The Torah portion, Yitro, is my Bar Mitzvah portion, and to my surprise, unlike many Conservative congregations that follow the triennial cycle, this one reads the entire parshah. The rabbi's brief d'var focuses on the opening, on why Moses' father-in-law, Yitro (Jethro) joins the Jewish people. 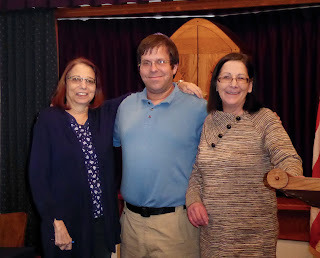 He quotes different commentators who note that he was drawn to join us because of our history, our love of Torah, and his familial connection. And how different things bind us all to Judaism. For some it is first and foremost an ethnic (familial) tie, for others it is about learning, and for some it is about the history of being strangers and the social justice mandate that flows from this. It was a new take on a portion that I've been reading for many years! After shul, I took a nap, then helped Mom prepare for a party that we are hosting in the evening. We pick up food at the Mediterranean Deli and it's all delicious: falafel, hummus, pita, kebabs, rice. The guests are great, too. We start with havdallah, then settle in for a beautiful evening. Mom's friends are all smart, thoughtful, politically-engaged. I'm reminded of how much I admire the life that my mother has built here. She came to Chapel Hill almost twenty-five years ago, when she retired. When she arrived, she knew no one. And during the years that followed, on her own, she built a fabulous life for herself, filled with friendships and learning and entertaining. She is always gracious and loyal and remains intellectually curious, learning new things daily as she approaches her 80th birthday. I am a lucky person to have her as my Mom. Mom and I work out at the gym in the morning. I'm trying hard to do my exercising regularly, so that I'm in decent shape for my forthcoming trek in Patagonia. I've put on too many extra pounds and they come off slowly at my age. Day by day, bit by bit. We spend the afternoon at the North Carolina Museum of Art. It's a surprisingly large and impressive gallery. The Judaica section is terrific, and there's a visiting exhibit of photos by Ansel Adams. I've seen most of these pictures before; they are iconic. Yet it's different to see all of them in one place, beautifully mounted and framed, and larger than I'd expected. Such a glorious window to the American landscape, and to the range of light that a master's eye and camera take in. We have dinner at a Thai restaurant, where I order my usual, Pad Prik King with tofu. I get it pretty much every time I eat Thai food, so I'm kind of the King of Pad Prik King. This one is good, and Mom and Charlie also enjoy their dinner. Then home and to bed and off in the morning to my next stop, Buffalo. I'm so thankful to Mom for her hospitality, and for the warmth of spring and the promise of new life blooming around us. 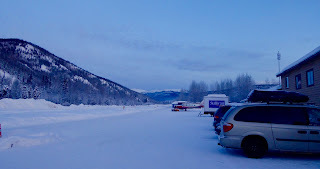 I get up relatively early (at least for this Alaskan sojourn)—9 am—to teach Sunday school at 9:30. There are about twenty kids, from kindergarten to sixth grade, and they’re a lovely bunch. The teacher is a good story teller and she recounts the tale of Isaac and Rebecca with love and patience. She’s clearly grown up with a Chabad background, as there are lots of references to HaShem and frequent interjections of bli neder. 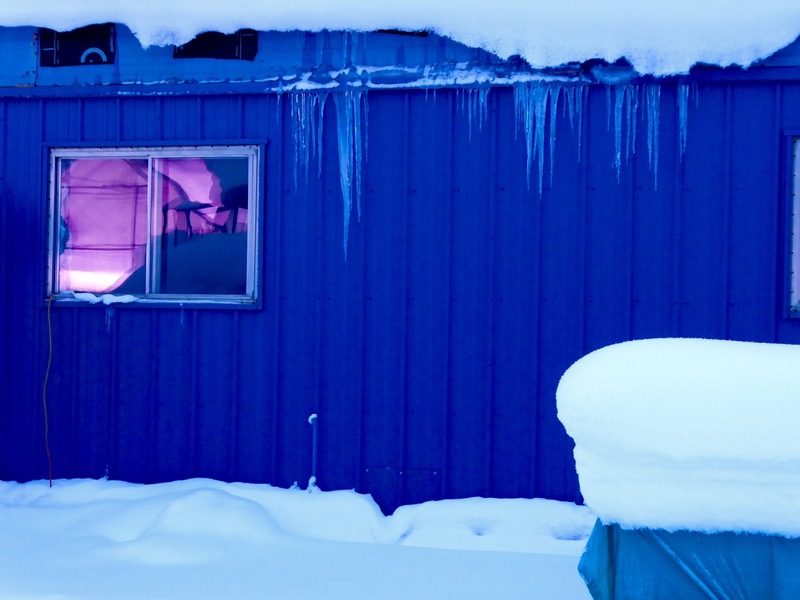 But there’s the Alaskan twist—she wears her long skirt with heavy mukluk boots and has that hardy, independent streak that brings folks here. 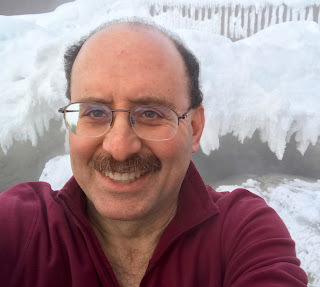 I lead the morning tefillah with the kids, show them how to put on tallit and tefillin and share a song for Tu B’Shevat, which arrives next week, in the thick of the Alaskan winter. 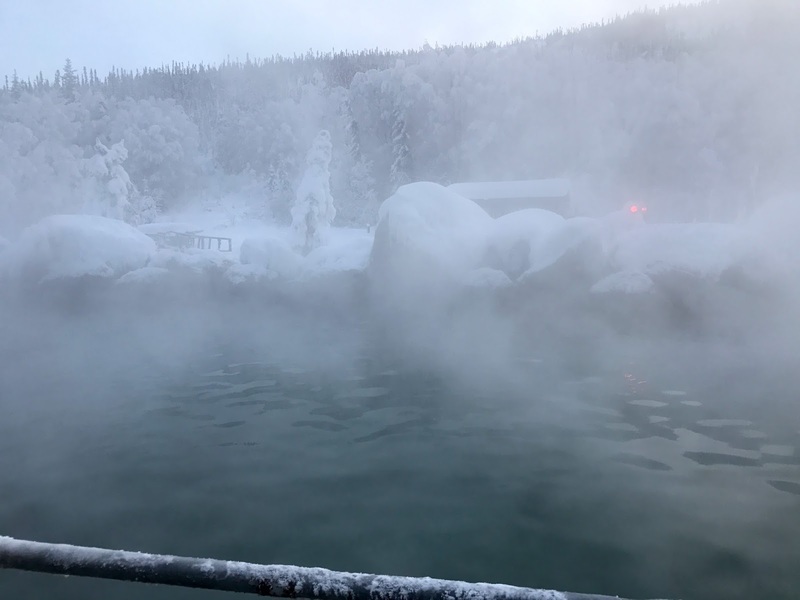 In the afternoon, I take my longest drive of my stay, to Chena Hot Springs, sixty miles out from Fairbanks. 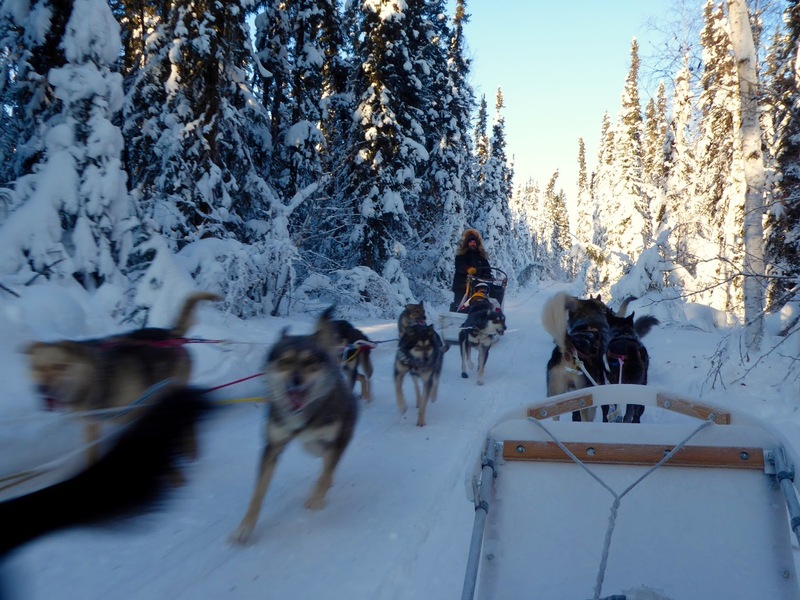 It’s a gorgeous trip, mostly following the frozen river and snow-blanketed forest. The place is a big complex, with a couple of lodges where many folks stay the night (remember—Chinese couples trying to get pregnant under the aurora). I soak for about an hour and a half in their outdoor pool. It’s amazing to be in 104 degree water while it’s -6 outside. 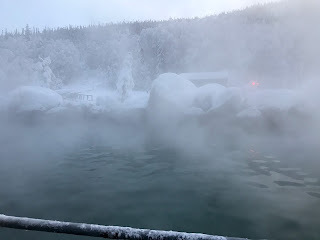 The rocks around the pool are all covered with snow and ice, and the steam is so thick in the cold air that it’s hard to see anything. But the water is soft and sulfurous and feels fabulous. I drive back to Fairbanks, listening to the end of the Super Bowl. Of course the Patriots win. It’s that kind of year—a Trumpian team for a Trumpian season. But out here, the Super Bowl feels small and far away and pretty damn insignificant—which, despite all the hoopla, is exactly what it is. I enjoy dinner at a Vietnamese restaurant, rest for a bit, and go back out for one last night on Clearly Summit. There are far fewer cars up there on a Sunday night, and no busses at all. Just me, a few young Chinese students and a middle-aged Texan tourist. We wait. And wait. And wait. For three hours. But nothing materializes other than a faint glow. At 2:00 am, we all head home. Surprisingly, I’m not disappointed. Yes, I’d have liked to have seen the aurora one last time. But in a way, this only makes me feel more fortunate to have seen the show I did on Saturday night. Rarity is part of what makes things beautiful. If the northern lights played on cue, they wouldn’t be as special. Besides, even without the lights, I love being out in the bracing cold and dark. I think to myself: sabbatical is off to a good start. I sleep late, waking around 11 am, after getting to bed at four last night. Tonight, I head back to Seattle. I call Janet and talk with her. The challenging part about this sabbatical is being away from her and the kids so much. I miss them dearly. My time apart from them only makes me more aware of how extraordinarily lucky I am to have them in my life. 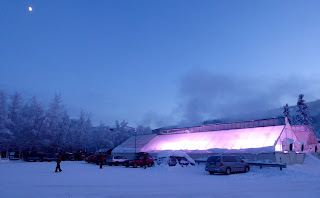 I work out at the student rec building at the University of Alaska-Fairbanks. I’ve managed to do this almost every day of this trip. It’s a little like the Boise YMCA: quirky, a tad ragged at the edges, friendly, warm. A place of community. Then back to pack. I gather up my things, do some laundry, head to the airport, return my rental car. My flight is delayed again and again and again and we finally leave around 9 pm, arriving in Seattle around 1:30 am. More late night hours. Check in at the Belltown Inn, finally to sleep before my day with Tanya at Bastyr. Then home to Boise. I sleep in after getting to bed around 2:00 or so. This is easy, given the late sunrise, and my room is very dark. Then I enjoy a quiet morning, reading Michael Chabon’s Yiddish Policeman’s Union. Time to read is one of the great luxuries of being on sabbatical. I have a lot of books on my list for the coming months: on pilgrimage, and Lithuania, and Jewish life, and a host of other matters. But I love reading books set in the location I’m visiting and so it is a pleasure to pick up Chabon’s quirky novel about a fictional Jewish state in Alaska. At noon I head back out Chena Hot Springs Road, past the farm where I did yesterday’s wedding, to a place called “Just Like Magic” that offers dog sled rides. Once again, I arrive to find it’s me and a busload of Chinese tourists. I bundle up and meet Heidi, my musher. 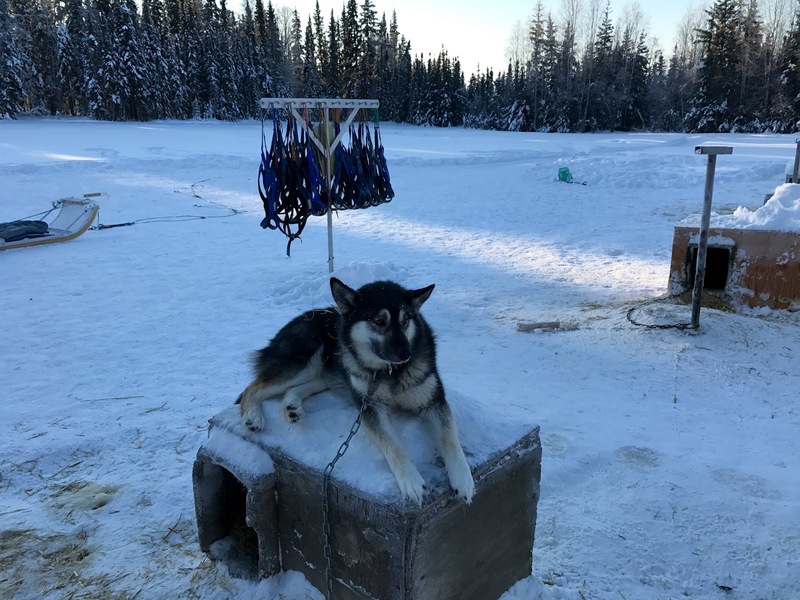 Then I settle into the sled for the one hour, seven mile ride. It’s so fun! Heidi leads the team of eight dogs through gorgeous forest, first pine and then birch. It isn’t light for all that long up here in February, but when the sun is shining, the light is golden and gorgeous. The sun never rises very high over the horizon, so it’s always that guilded quality of illumination that seems to glow from within all it strikes. And the sky is cerulean blue. So we slide along the paths in the sub-zero sunlight and Heidi tells stories of mushing. 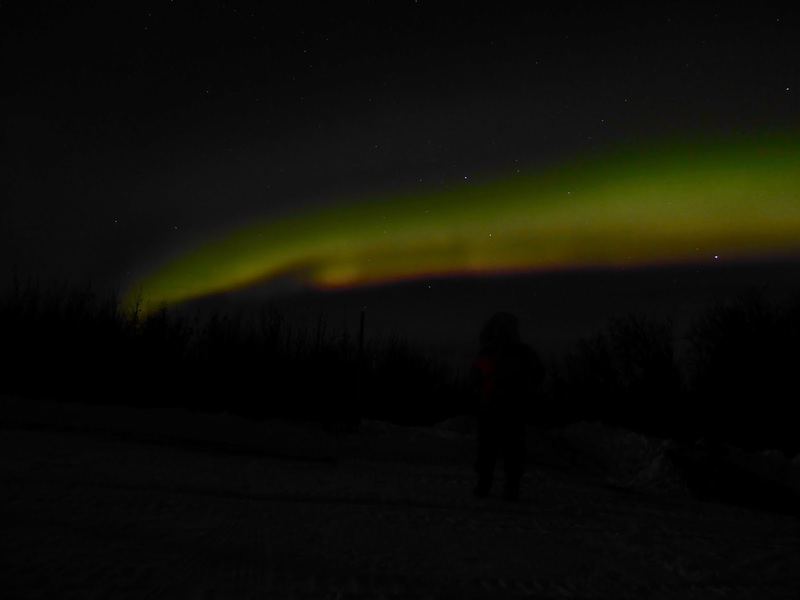 She did the Iditirod last year, and loved being out with the dogs, sledding through the wilderness in the long Alaskan nights, the auroras dancing overhead, and sleeping by day on straw beds with her dogs providing warmth. The dogs clearly love to run and she loves to run them, and our hour goes by too quickly. 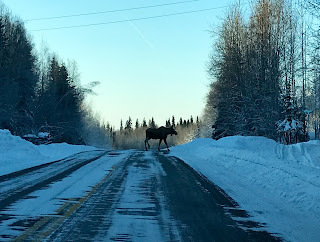 On my way back to town, I’m cruising down the road when I stop for a crossing moose. Quite the sight! I spend the afternoon doing some Shabbat prep, and schmoozing with Beth, the synagogue’s office manager and only paid employee (she’s also a member), and her granddaughter, who has the day off from school. 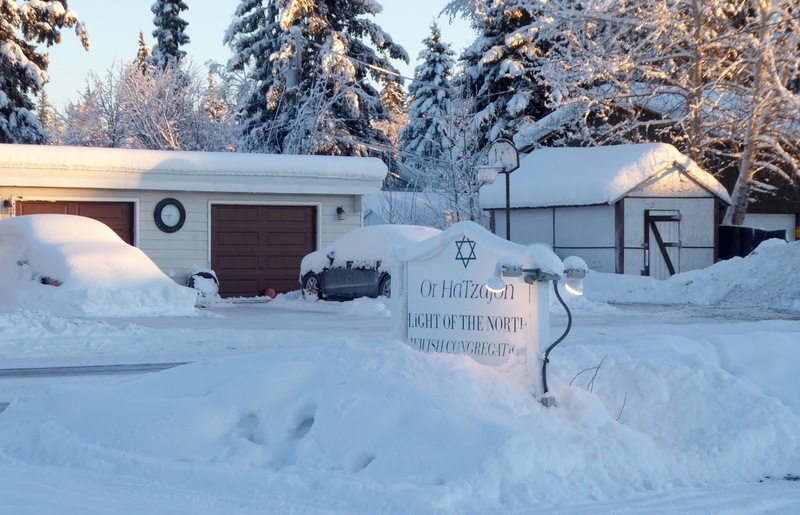 Beth makes a few copies for me, and I listen to her stories of Alaskan Jewish life. 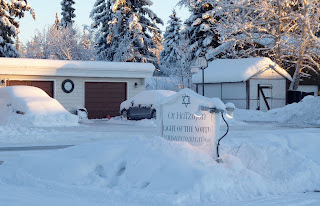 In the evening, I lead services at Or HaTzafon, the northernmost synagogue in the world. They have a good sense of humor, calling themselves the “frozen chosen.” About twenty-five people show up for Shabbat evening, which is, as everyone notes, a great turnout for the winter season. 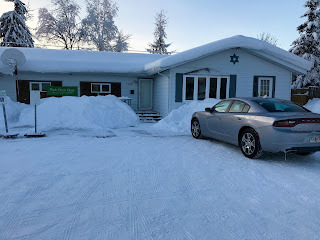 During the summer, when Fairbanks is full of tourists, they have a rabbinic intern from HUC who stays for a couple of months. But they are not accustomed to having a rabbi in the winter. They appreciate my being here—and I’m grateful to be here, too. I lead; they point me to the melodies that they know. The portion is Bo, which recounts the final three plagues. I focus my d’var Torah on darkness, which is the common tie between those plagues: locust so numerous that their swarms darken the sun; arafelet, the thick darkness that descends upon the Egyptians’ dwellings; and the slaying of the first born, which happens at midnight, the darkest hour of the day. I note that these are also dark days for America, with the Trump administration’s cruel orders against refugees and immigrants and venomous attitude toward the free press. Then I remind them—and myself—that darkness is also the place where life is born and nurtured, where seeds germinate, and roots do the quiet but essential labor to feed what blooms above the earth. As Sue Monk Kidd teaches, the darkness that we fear as a tomb can also be a womb. It’s not a new message for me, but here in Alaska, in February, when the days are so short, in a season of political peril unmatched in my lifespan, it feels poignant and timely. The community reminds me a bit of my own. They are unpretentious, hardy, haimish. Lots of mixed marriages, almost all moved here from somewhere else. 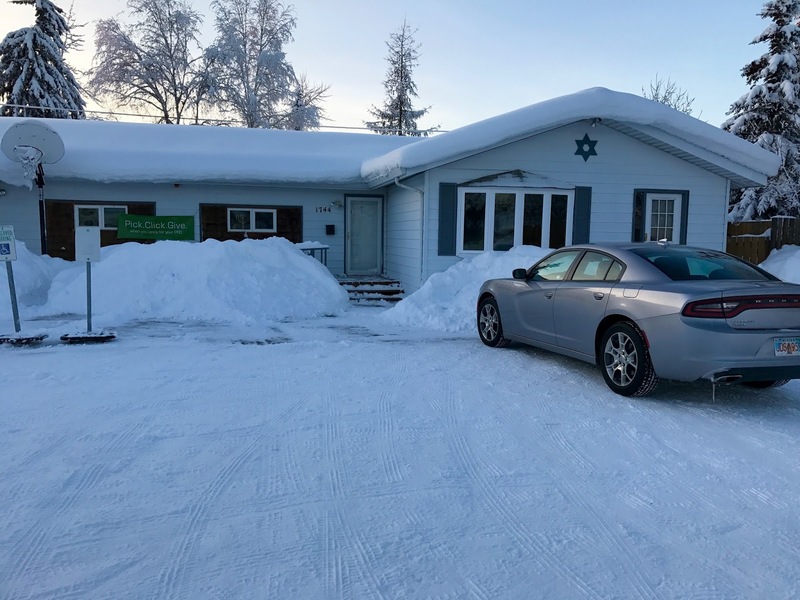 They express gratitude, they represent the “do it yourself” Judaism of smaller Jewish populations, they love the outdoors and are proud of who they are. Being with them reminds me of how much I love my congregation, how lucky I am to be the rabbi of my community. After services, I go out for a late Shabbat dinner with two congregants, including the president, at a sushi restaurant. And then to bed. I lead a “Bagels and Torah” study session for a small but enthusiastic group at Or HaTzafon. We focus on Pharaoh’s hardened heart—and our own hearts' hardenings. It’s a lovely discussion, a joyful learning together. How lucky we are, as Jews, to have this Torah, which instructs and inspires us. We approach it so differently, in so many ways. Yet wherever we are, it goes with us, it guides us. I enjoy a Shabbat nap, then plan to go to a tribal potlatch with a friend I know from Boise who is living here. But when we show up, it’s already filled beyond capacity, so I enjoy another quiet Thai meal and then head back out to Cleary Summit for another chance to see the aurora. I arrive around 11 pm and this time it’s much more crowded than on Thursday night. The lot is packed with cars and tour busses. But not much is happening. For two hours, there’s just a very pale band across the center of the sky, running through the north star, Polaris, which is almost directly overhead at this latitude. We sit in our cars, get out and walk around a bit, set our cameras on our tripods, then get back in the cars to warm up. So it goes for a couple of hours. By 1 am, I am getting tired and prepare to leave. And then the sky explodes in light! But "explodes" is the wrong verb, really, because it’s nothing like fireworks, which are beautiful but also loud and violent and war-like—the rockets’ red glare. This is soft, feminine, shimmery. The lights move—astoundingly!—like a group of female Motown singers from the ‘60s, sashaying with utmost grace in their elegant gowns. Curtains of green and yellow and red undulate across the sky. I say the blessing again, this time with astonishment and wonder and awe. The Holy One really does renew the work of creation, all the time, sometimes—most often—with real subtlety, but on rare occasion, such as this, with miraculous exuberance. This is what I’ve wanted to see all my life, and I am immensely grateful for the show. 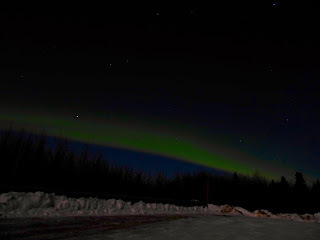 Then, just as quickly as it began, the show ends, around 1:30 am, and I head home to Fairbanks, filled with wonder and gratitude. My sabbatical begins well, with a lot of walking. I arrive at the Seattle airport mid-morning, catch the light rail into town, and stroll around the city center for a few hours. The weather is crisp blue skies and surprisingly cold—which is a relief since I am wearing my super heavy-duty Alaska down coat, lent by a friend, which was way too bulky to pack. It feels good to be on sabbatical, though I suspect it will take me a significant chunk of time to settle into the new routine of no set work routine. I meet for lunch with a friend and former CABI member who now lives in Seattle. We enjoy a terrific falafel—maybe the best I’ve had outside of Israel—and I notice that I don’t mind the incredibly slow service, as don’t have anywhere I have to be any time too soon. What a luxury. After more walking—cranes everywhere in the downtown core of this booming city—I meet Tanya at the Capitol Hill light rail station around 3:45, after she finishes her classes at Bastyr. It’s great to see her, as she picks me up in her still-newish car I bought for her last summer. I think how blessed I am to have a grown up daughter who is driving me around her city. We go out for a delicious early vegan dinner and ice cream and then she drops me back at the light rail, where I catch the train back to the airport for my flight to Fairbanks. The flight is happily uneventful and I arrive around 10:30 pm. I remember the airport here from my last visit, back in 2009. It’s surprisingly large and lovely for this small and rather ramshackle town—no doubt a bit of political pork barrel. Then I get my rental car and drive to the synagogue, Or HaTzafon, the Light of the North. When I pull into the synagogue, Charles and his family are waiting to let me in. I’m amazed that his young daughter is up this late but they’re all in great spirits and so welcoming! I unpack, settle in, and go to sleep. I start my sojourn in Alaska with a wedding. Michael and Shi Yi were hoping to get married under the aurora but the aurora didn’t cooperate. 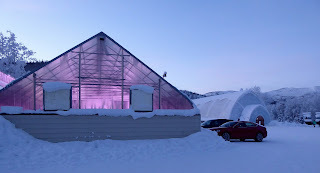 So instead, they ask if I’ll marry them at 10:30 am (just as the sun is rising) in a field at Arctic Roots, the farm where they are staying outside of town. 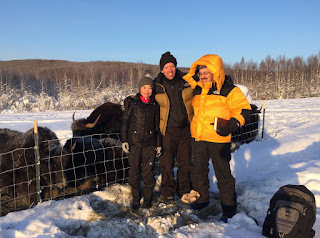 I drive out there—about 25 minutes down the snowy Chena Hot Springs Road—and do the wedding, knee deep in snow in front of a small herd of yaks. 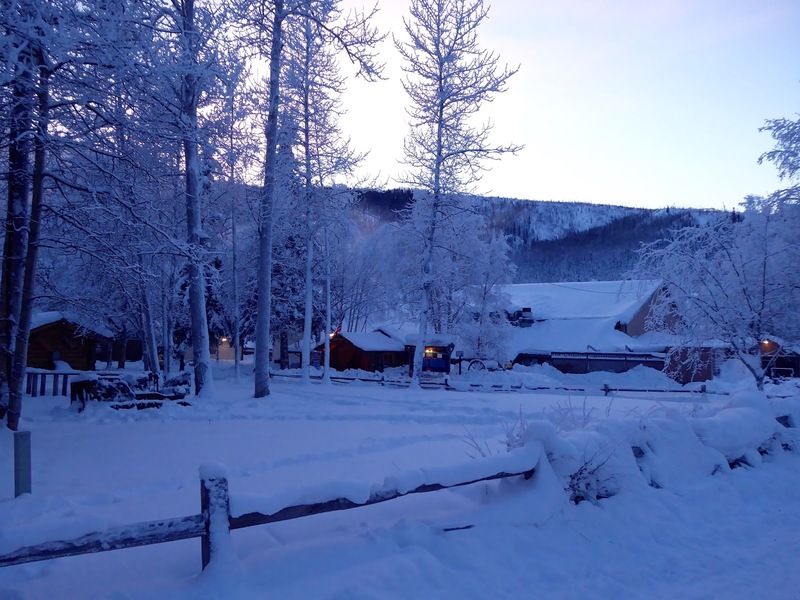 The only witnesses are the couple who own the farm—a hardy pair who previously lived in a cabin they built together, off the grid, with no plumbing or electricity. Michael and Shi Yi exchange their rings and vows, I chant the sheva brachot, the yaks nod “Amen” and he breaks the glass on a wooden board atop a patch of hard-packed snow. For lunch, I have the first of several Thai meals, as Fairbanks seems full of Thai and Vietnamese restaurants. There seems to be a significant Asian population here. 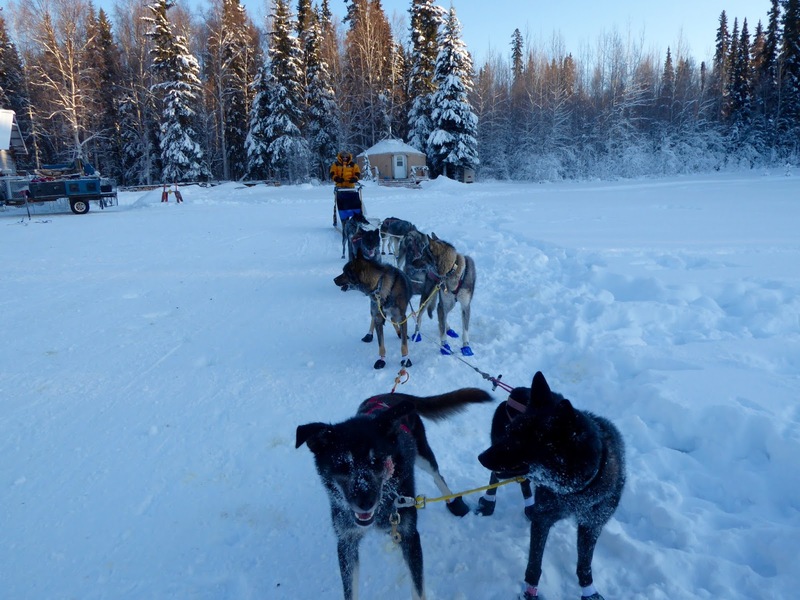 In fact, I noticed that Fairbanks is far more diverse than I’d expected. I suppose some of this comes from the large military population, and the tribal community, too. Many mixed race couples. 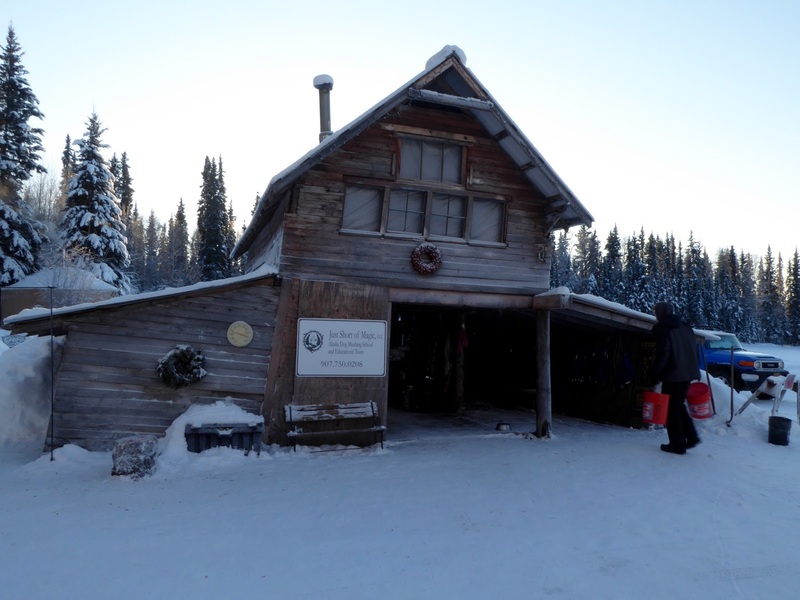 I learn a bit more about the history at the Morris Thompson Cultural Center downtown, on the banks of the frozen Chena River. Then I go shopping at Safeway, to stock the refrigerator and pantry back at the synagogue. One of my goals for this sabbatical is to eat healthily and lose some way, so having a good supply of fruit and vegetables and healthy snacks is important. Of course everything costs twice as much as at home. 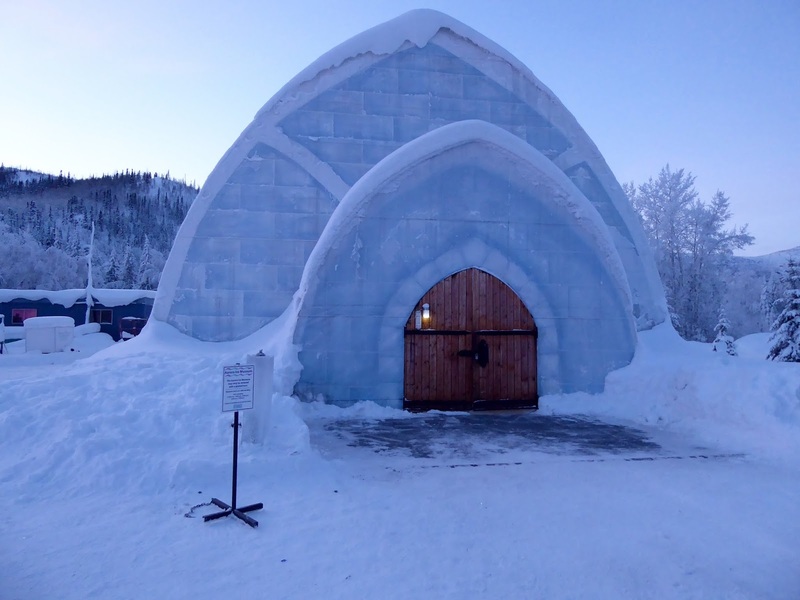 It’s expensive to live in Alaska, given the cost of transporting stuff up here to the far north. I rest and read and study the map of the city. I really want to get a feel for the lay of the land. One of the hazards of Google maps and GPS is that you can get around a city without ever orienting yourself. You just go where the technology tells you, with no sense of direction. I don’t want to do that. And Fairbanks is small, so I can learn it pretty quickly. I want to be mindful, to know where I’m going. 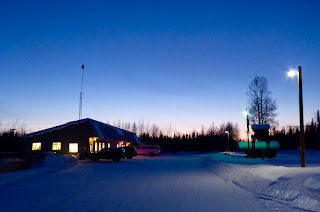 And where I’m going tonight is Cleary Summit, a suggested spot for watching the aurora. It’s about 25 miles out of town, down the Steese Highway. It’s mostly pretty easy driving, then gets a little tougher the last few miles as we climb up the mountain and the road becomes icier. But when I arrive, around 11 pm, there are quite a few cars and a couple busses full of Chinese tourists. We all sit and stand around in the flat lot atop Cleary Summit. 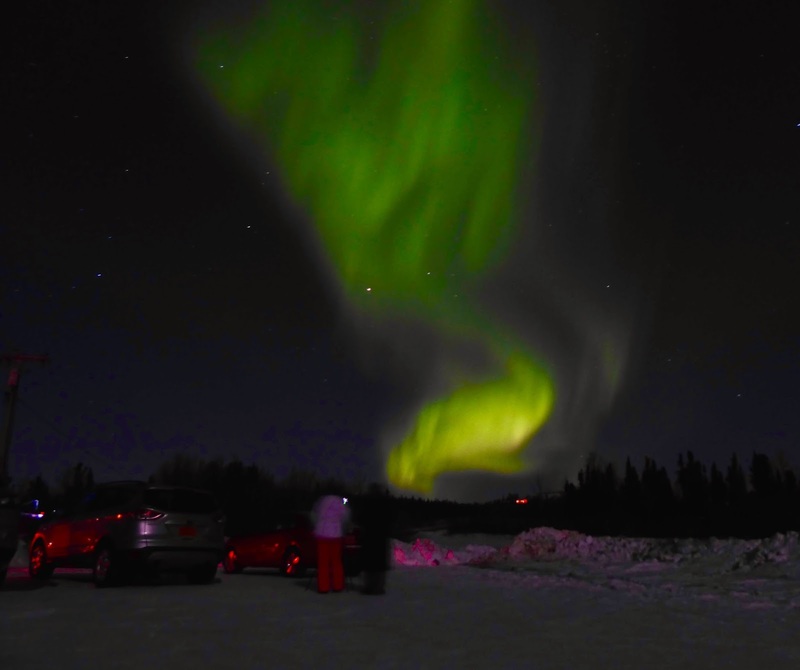 I’ve heard that for many Asian couples, coming to Fairbanks for the northern lights is a kind of pilgrimage. It’s said to be especially propitious to make love under the lights—a path for previously infertile couples to be pregnant. Nobody is making love up here. Most are sitting in their cars, a few get out to set out cameras on tripods. It’s around -10 degrees, the sky is crystal clear. I find it bracing and love walking around in the cold. 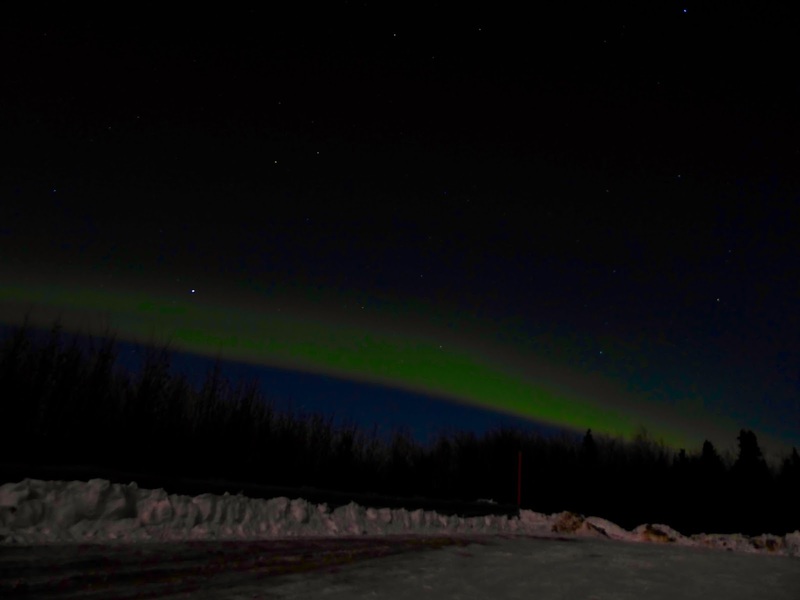 And then others start coming out of their vehicles and the busses empty out—the aurora arrives. Sort of. It’s a faint, greenish band stretching low across the northwestern sky. I take a picture using the “starry sky” setting on my new camera. The long exposure—thirty seconds—yields an image that is, in fact, way more vivid than what we see with our naked eyes. It’s beautiful on the camera screen. In person, it’s lovely, too. Not amazing, but lovely. And I get to say the blessing over astronomical phenomena: Baruch atah. . . oseh ma’aseh b’reishit—Praised are You, Holy One, who makes the work of creation. I’ve waited a long time and come a far piece to have this opportunity and I treasure it. We all watch, and wait, and then, around 1:00 or so, the lights fade and we head home.